Once a year I don a fancy dress, nylons and mascara. That’s a far cry from my early career when it was a daily habit, but a benefit of both being older and having an at-home job. I don’t particularly like putting on nylons and mascara and nobody is going to make me do it at age Almost Sixty. In this case, though, I put on spit and polish because I’m going to a pretty fancy dinner that celebrates a feisty priest, a fervent nun and miracles they’ve wrought in 20 years. Since I’m not even a Catholic, it might seem doubly weird that I’m going to this event so I’ll come clean: the dinner is for client Nyumbani. However, I stopped thinking about them as “client” long ago. How could I not? Nyumbani was born from the mind of Father Angelo D’Agostino, a Jesuit priest serving in Africa whose heart simply could not fathom the many children left homeless and orphaned by HIV-AIDs. These children had no hope of survival and no family to turn to. They were abandoned in hospitals or along roadsides at an astonishing rate. Father D’Ag, as the world now knows him, and Sister Mary Owens from Ireland started a hospice, taking in three small orphaned babies, and beginning the planning process for an orphanage designed to provide the babies love and medical care for what remained of their lives. But the seed they were planting grew rapidly, fed on tough love and two determined people. Father D’Ag already had some connections in the United States and began to build a powerful network of supporters. He was the type of man who would not take “no” for an answer, though he was soft-spoken. 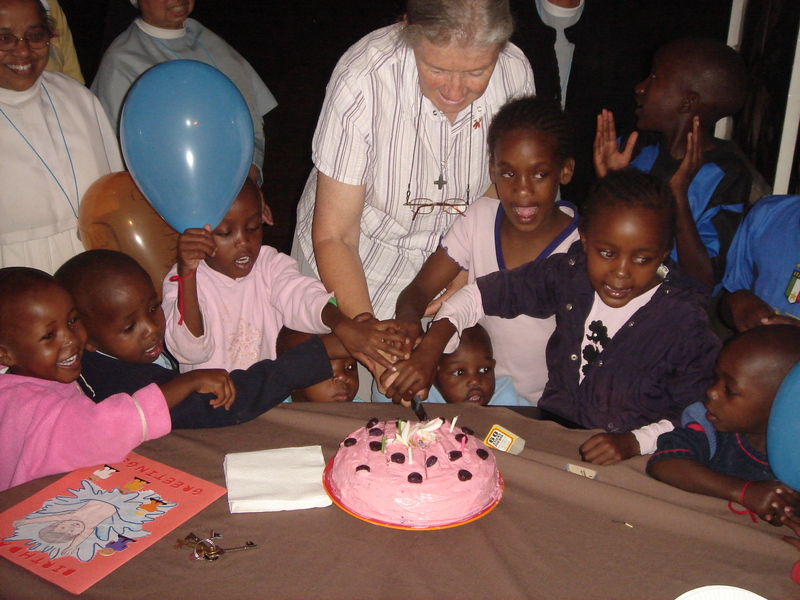 With Sister Mary, who is an educator, behind him, the two grew the orphanage to where it is today: over 100 children. But even more astonishing, Nyumbani (which is Swahili for “home”) was transformed from a place where kids went to die gracefully to a place where kids went to live and learn and love each other. And building on that very strong base, Nyumbani began to develop an outreach program to set up centers in the most desperate of places―the slums of Nairobi―to help the thousands of families trying to support someone suffering from HIV/AIDs. That center, now supported by many other parties, including international governmental relief agencies, helps thousands by giving guidance, food, medication and moral support. And a second idea began to germinate: what if someone cared enough about what was happening to take the children who had lost their parents to HIV/AIDS and the generation of grandparents who had lost their sons and daughters and put them together, taught them how to be self-sufficient, and gave them the tools necessary to begin their own village. Don’t even think of scoffing readers. From the red clay dirt on a piece of land three hours out of Nairobi, the Nyumbani Village has risen, home to a thousand children and 100 grandparents, housed in 100 homes and featuring three levels of schooling, a medical clinic, a place of worship and gathering and a thriving generation of Africans who stand as an example of what can be done with a dream and a lot of determination. Government agencies, foundations, research facilities, charitable and green organizations, and thousands and thousands of people all over the world have joined forces to make this latest dream come true. Meanwhile, Father D’Ag, who lived to see his ideas come to life, and Sister Mary, who now stands at the helm of this tremendous effort, get to witness the miracle of what happened when they took those three babies into their hearts and home. As their lowly U.S. editor (they now have boards in five countries), I get to put together a newsletter that practically leaps onto the page because of the individual stories that joined together to create this miracle. And I get to put on my Sunday clothes and act like an adult. At least until someone says something that reminds me how wonderful this organization is, and I start bawling like a babe. For information on Nyumbani, please visit www.nyumbani.org.